Pinterest boards are created for different occasions, holidays, fashion trends, and even rooms of a home. They are great ways to get inspiration or ideas about how to decorate your own home. We have created many Pinterest boards of our own, which have great ideas for each type of interior design style. One of our boards has a lot of great ideas on how to create a Gothic style in many different rooms of a house. You can use many different types of flooring and color schemes to help create a Gothic design. 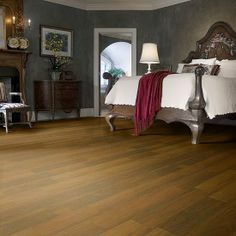 Hardwood flooring, luxury vinyl tile, vinyl, and carpet are the most popular choice for a Gothic design, but you can use whatever flooring works best with your room design. 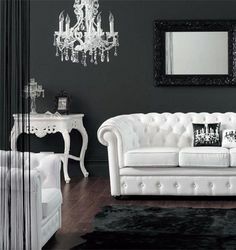 Click here to see our Gothic Allure interior design Pinterest board. Click here to see our selection of hardwood flooring. Click here to see our selection of laminate flooring. Click here to see our luxury vinyl tile flooring. Click here to see our selection of carpet. Click here to see our selection of vinyl flooring. We would love to hear about how you would create a Gothic design in your home, and if you already have a Gothic design, we would love to see pictures. This entry was posted in Carpet, Do It Yourself, Hardwood Flooring, Laminate Flooring, Luxury Vinyl Tile, Vinyl Flooring and tagged cheap carpet, cheap flooring, cheap laminate, cheap luxury vinyl tile, cheap vinyl, Gothic interior design, Hardwood Flooring, interior design, Pinterest by Tiffani. Bookmark the permalink. I really like the flooring in that bathroom. The tile meshes well with the rest of the rooms styled look. 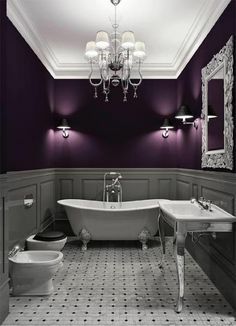 The purple walls really set the room apart though. These are some great inspirations for rooms in my home.